I feel like too often when disaster strikes, I am numb to it, I watch the news and just nod, giving a token response, “oh that’s so sad,” and then carry on with my day to day life. Why is that all I can muster? Am I so numbed to tragedy that I am indifferent to the horrors of terrorism and death? How did I get like that? What’s worse, is I am not the only one. Yes, sometimes we rally together and help ‘clean up the streets’ like, for example after the London riots, but generally, society is becoming as emotionally apathetic as I usually am. It’s not ok.
As a race, we seemingly strive to better ourselves, ‘to boldly go where no man has gone before’ to quote Star Trek and confess a little guilty pleasure of mine! But when we make mistakes I feel like we too often brush them under the carpet. Dismiss them in the name of science and progression. So I wanted us to use this particular writespiration to take stock. Watch the video, sound on is compulsory, (the music makes it much more powerful) Its only a couple of minutes. Use the video as inspiration. You don’t need to write about chernobyl, write about anything you like, maybe you could take stock of something significant, a disaster, a personal tragedy or maybe you want to turn it on its head and write about a success or achievement. Write a sentence, a few lines, a poem, or an entire short story. 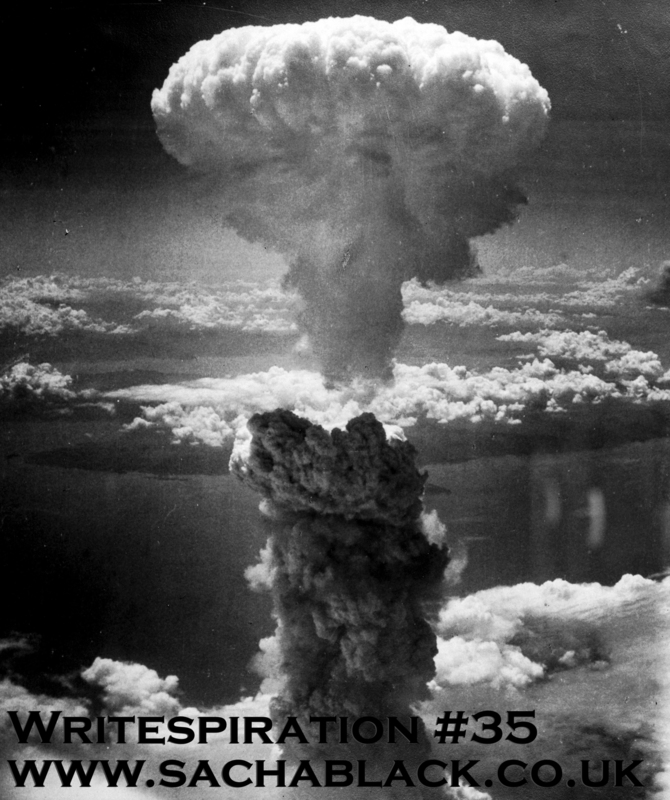 Whatever you like, drop it in the comments below or send me an email, and I will post it with next weeks writespiration with a link to your blog. I brought you carefully home from the nursery, gave you a roof over your head and a nice soft bed, kept you warm and cosy, provided for your every need, supported you when you needed it, watched proudly as you grew tall and strong, and you reward me with one lousy tomato… next year I’m growing courgettes! John knew he would never be able to stop calling his brother ‘Fred’ and instead call him ‘Father’. Next, another first from Jane Doherty and wow what an amazing story to fit in just one sentence, truly talented. Welcome to the Writespiration team Jane. He poised, arms raised, and plunged, a perfect arc, slicing the water to join the rollicking seals, and though she watched until the sun set, night fell, and the seals disappeared, he never broke the surface. I knelt on the double yellow lines, the base of a complex pattern the child had chalked on the path. “That’s an interesting picture you’re drawing.” I smiled fatuously. She raised her head, fixed me with angry eyes. “You’re blocking the earth,” she said. “Oops, sorry.” I shifted back a bit, humouring her. “Any particular reason?” She might have been only a tot but her attitude was beginning to irritate me. She shrugged and carried on colouring in the bit in the middle alternate red, orange and yellow squiggles. I moved closer to work out what it was. She glared. She cast her disapproving gaze from my face, down my bulky adult body to my trespassing feet. She took the red chalk, drew a small round circle, and coloured it in vigorously. Satisfied, she pressed it with her right thumb. The world dissolved in a screaming inferno. Last but by no means least Keith, with a rather long sentence… but hey, he’s good with grammar! I was sent down for fifteen years for armed robbery; although if I behave, I can be out in eight; but that’s not what the judge said when the foreman of the jury (and they were a rum bunch, I don’t mind telling you) handed him the piece of paper saying I had been found guilty, even though all the evidence cleared me, my alibi being cast iron and the character witnesses I brought in being pillars of the community, well, most of them, anyways, but they still said I was guilty and that judge, who wouldn’t have known an honest man if he stood up and thumped him, bloody agreed with them – senile old git that he was, and sent me down for a fifteen stretch! So many of the great world religions are responsible here—Soviet Communism, rampant Liberalism, and State Capitalism to name but a few. Great poem. Thank you Jane. The videa brought back growing up in Cold War Britain. Sorry Sacha, I can’t see your email address. I lobbed it into ‘comments’ instead. Perfect that’s what most do 🙂 will link to your blog next week ? yeah I should imagine so. God, how awful that I could so easily forget about Fukushima. and yet, there are a million other tragedies that we all forget, I guess that was kind of the point of the post though… hahaha vegetarian cook book, lucky for me I’m already veggie! lol. I’m glad you chose Chernobyl; it brought back a lot of memories. Fukushima is too recent, it wouldn’t have worked. Here’s mine… more of a personal tragedy, this one. Just wow. I don’t even…. I…. Just wow Ali. What brave little girls you were and what a horrific memory to be saddled with. I was gripped the entire way through. Sucked into that room straining at the door to hear with you both. What beautiful description too. The innocent emotion and thoughts are so real and you just tell them so perfectly. Is the flash getting easier to do yet? I hadn’t imagined it was taken from reality! Thought it was a brilliantly imagined bit of somebody else’s childhood. Glad there’s some artistic licence, but I’ll read all your stories with different eyes now. Omg GEOFFFFFFFFFFF reaaaaaaaaally???? No eyes. I nearly threw up Nevermind bloody Susan! You have a habit of whopping out some gruesome twist properly didn’t see that coming either! Not with all that humour at the start. Bloody loved it and your description of unlucky crevasses – fab way to describe it ?? Quick one—inspired by the images not by the human tragedy of Chernobyl. I really enjoyed this, a stark utopia for animals, Jane. Thank you Christopher. I like to believe that when we’ve finally destroyed everything we have ever created, the world will start again…but without us. Jane, let’s be honest; would that really be a bad thing? It would be wonderful for the world, sad for humanity. But I reckon we’ve had our turn and made a right bollix of it. Let the foxes and the trees have a go. I doubt we’ll get anywhere near that. The planet couldn’t take it! It’d be just a lump of grey, barren rock rolling round the sun. Wow I love this what w fantastic idea to write from an animals perspective. And what amazing imagery too you conjured for me. Thanks so much for participating ? Ohhh me too. We have a few visit our garden one family in particular I sat and watched the old boy sunbathe in our garden for hours one day ? I have a beautiful childhood memory of foxes, hearing them bark but never seeing them except once, a whole family by moonlight playing on the lawn. When you see animals playing with their children, you wonder what exactly have we got that’s so special.